I’d trained for about three months, getting up early for interval training before the hot TX sun demanded I go right back inside. Then at dusk going out again to run-a-little-walk-a-lot while my stamina claimed some courage. Volunteers dressed up as ghouls and witches jumped from behind trees and fences along the pathway. Zombies roamed and groaned their way against the grain of runners. It was all fun and games until I lost sight of my daughter. That’s when it got spooky. I could not see my daughter Jenna, my running partner who kept me from giving up. Jenna’s a lot younger than me, so it’s no wonder she didn’t want to hang back and shuffle along. I even told her to run ahead. But then the doubt started. What if I want to stop? Jenna won’t be here to tell me to power up. How will I keep going if Jenna’s not here to talk me through the sameness of a 3.1 mile jog? You know you hate running, why do you even try? Two years before I’d tried to become a runner, but I could not make myself enjoy it. Jenna and I’d run one race back then, and I’d stationed myself behind an 70 year old man who ran with a walker. Really he ran with a nurse, but still, and there I was pacing myself behind him. He ran slowly, steady and sure, never stopping to catch a breath or break stride. A vacuum cleaner ate my lungs, but I kept moving. By the end, I thought my rubber legs would kill me. Now, here I was in much better shape. 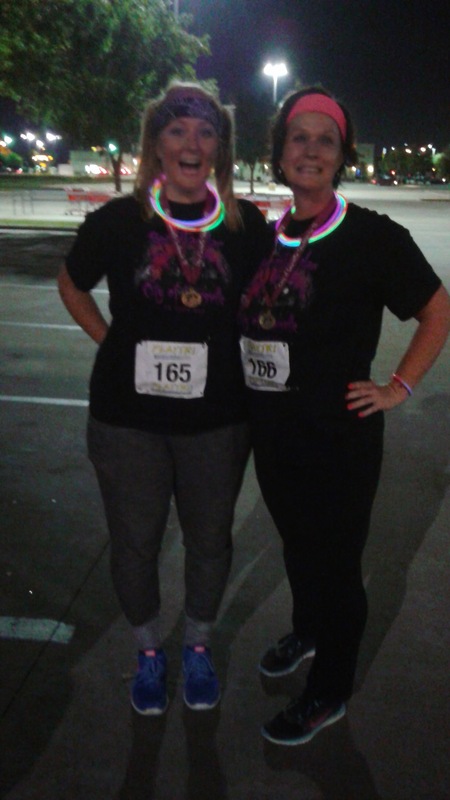 Jenna and I worked out hard, and I knew I could run this whole race without stopping. I just needed to prove to myself that I could. So I ran. I steadied my breathing, and I refused to stop. Booing ghosts and all. I got about a hundred yards from the finish line, and I could hear “Monster Mash” blaring from the pavilion. I knew I’d almost made it when about eight little stick-figure-girls cut a corner and raced past me from behind. I’d run the whole race, slow but steady, and these little adolescents with their long legs and glow sticks ran just long enough to “glisten” as they crossed the finish line right in front of me. I crossed the finish line complaining. I didn’t even notice my time or relish the fun of finishing. I let them steal that from me. 1) I am stronger than I think I am. 2) I can do hard things, even by myself. 3) I shouldn’t let anyone at anytime steal my celebrations or my joy. So what does this have to do with teaching? with readers and writers workshop and sharing what I know works? with conferring with my readers and teaching kids to write? with facing a room full of teens each day who need all the skill I’ve got? Yeah, if you’re reading this post, I know you get it. We train and practice and learn. We keep talking about books and conferring with our kids. We find joy when they light up about a book — or finally finish one. We focus on the skills we know our students need. We stay positive and hold fast to our pedagogy. We know workshop works. We revision our classrooms to meet the needs of our students — every single day. . . and sometimes every class period. We keep moving, so our readers and writers will keep moving, too. I feel you, girl. Today I felt like I reached one finish line successfully when I read some really amazing, skillful narrative drafts that my kids wrote. But I also felt miles away from another finish line when I realized only about two-thirds of my kids turned anything in!!!! We just have to keep running every day, huh? Shana, that’s called balance. Not necessarily the good kind but still. Ha. This is why you are the natural coach that you are. You are able to put ideas into words and illustrations that not only outline the situation, but color in the details so that we can come along on your journey with you. This is timely because right now I only hear the booing of monsters, but not the “Monster Mash.” Yet. I need to keep running the race. Whit, you are so kind. You, my friend, are the inspiration. You care more about your teaching than most any teacher I know. You give your all. All the time. Thanks for being my friend and my cheerleader.